How did the world come to Europe? Drawing on the photographic archives of the Museum of Ethnography in Stockholm, Black Atlas turns the ethnographic gaze onto itself, reflecting upon the administration of racialized labor for transporting artifacts from across the world to the collections of European museums. The 20th-century history of the Museum of Ethnography left a photographic imprint, and this visual reliquary takes center stage in the exhibition by shifting the viewer’s attention from singular world travelers to the deployment of local labor. 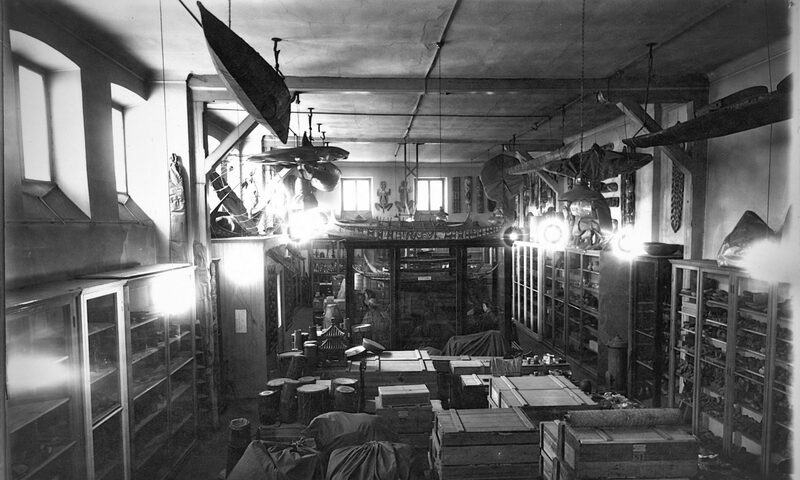 A selection of photographs and documents reveals the infrastructure behind the accumulation of artifacts and the required labor for bringing them to Europe. Featuring prominent Swedish collectors such as Eric von Otter, Eric von Rosen, Gerhard Lindblom, and Gösta Montell, Black Atlas recognizes the work of the nameless porters and caravan workers who carried their burdens. Black Atlas was produced by Jacqueline Hoàng Nguyễn while in residence at, and with the support of, The Museum of Ethnography/National Museums of World Culture, Sweden. The exhibition is funded by the European Union project SWICH – Sharing a World of Inclusion, Creativity and Heritage with support from Sharjah Art Foundation. Support for its presentation and programming at Haverford College is made possible with support from the Konstnärsnämnden – the Swedish Arts Grants Committee, the John B. Hurford ’60 Center for the Arts and Humanities, the Bryn Mawr College Museum Studies program, and the University of Pennsylvania Museum of Archaeology and Anthropology.